This is a most welcome blast from the (apparently) recently unretired Colley. Made up of two side-length tracks that reveal multitudes, No Way In sounds like a document of some human condition as well as a piece of music. There’s long been an obsessive quality to some of Colley’s music, a relentless diving down through particular devices that are turned inside and out rather than used as links in a chain of ideas. That’s evident from the start of the A side, which is like a possessed tape machine revealing multitudes, with what sound like distant fragments of old Bollywood barely audible beneath the twittering furor. Here, Colley seems to prefer it noisy, discordant and jagged rather than fulsome. He certainly layers sound, but the accretions actually seem to pull against the idea of a clear direction or identity. No way in, indeed. As things get ever denser and louder, the piece sounds like kitchen appliances going to war in a bathtub while a clanging trolley calls for attention. It’s at this point, about midway through this track, that Colley finally digs into some of his more recognizable sonic obsessions: that insistent rising whine, the sounds of hissing lawns and insect choruses, and delicately flanged slabs of pure noise. But it probably wouldn’t be a Colley release if he didn’t also undercut these tendencies, which are soon snipped off to reveal the electronic version of the needle stuck at the end of an LP side, a tasty cycle of glitch and repeat. The B side begins with grouped vibrating metallophones, but this singing metal is very much more gnarly than, say, bowed cymbals. It’s more like wrought iron engaged in Tuvan throat singing, overtones and all. Colley’s not interested in consonance for its own sake, but as another element that can unsettle you as you wait for the sucker-punch or the odd disjuncture. This happens before long on this piece, just when things sound as if they’re gelling. First, Colley sets up some tinkling percussion, like supplicants on the exterior of the rite, and follows it with a catalogue of mewls: grinding, whining strings, rubbed wood or Styrofoam, a baby crying, the whole effect coming across as if the pacific opening minutes of the piece were now suffering and breaking down. There are abrupt pauses, electro-glitches, and loads of static, serrated interruptions, like the sound of one broadcast trying to find its way into another. And in a weird parallel to the A side, Colley opts for a bleak and lonely ending: a spinning top on a slab of marble with flinty knives sharpened in the backdrop; a weird bullroarer effect with crackling vinyl; some sudden, blaring radio interruptions, and then railroad tracks delivering us to a sudden end. Somewhere between the metaphorical and the material, Colley is grinding away at showing us our own commitments to form. So is the breakdown his or our own? Lovely questions that emerge from deeply compelling sound. 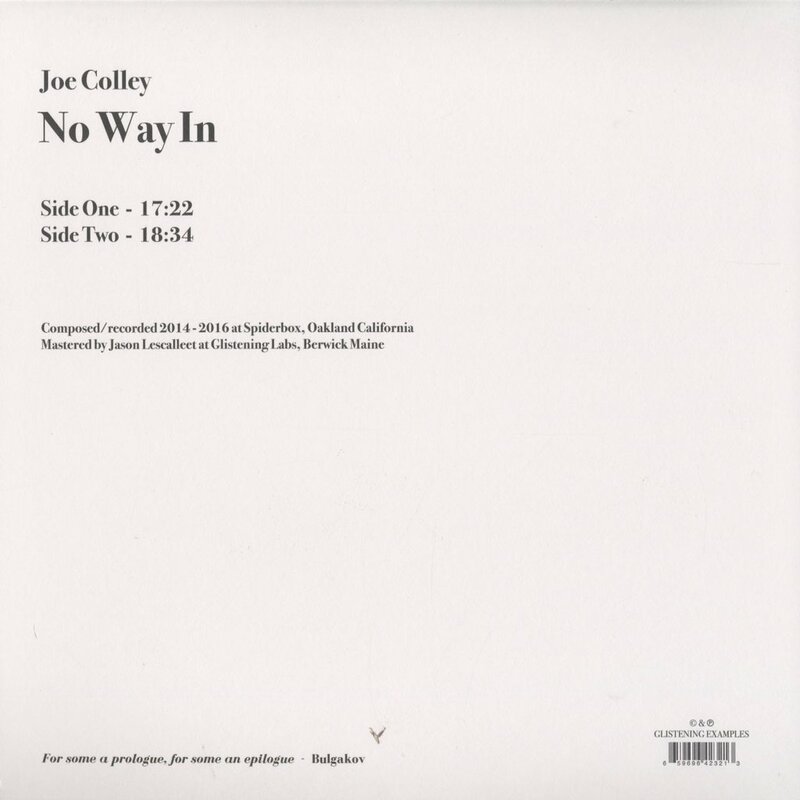 No Way In celebrates Joe Colley’s return after a self-imposed hiatus from creating music. 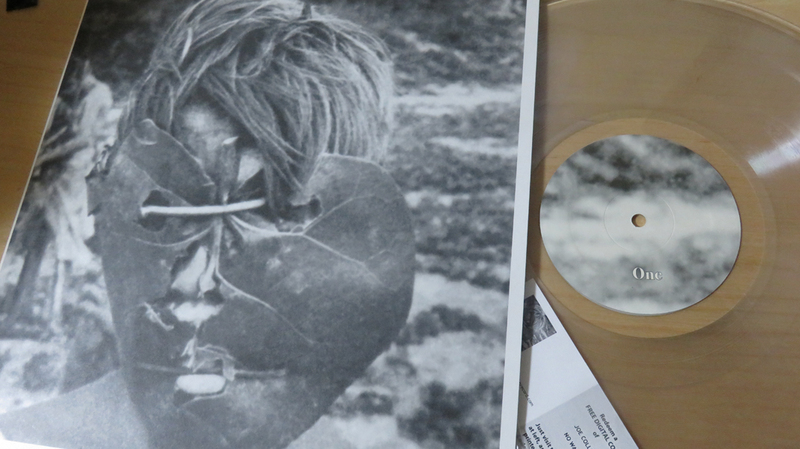 Colley was last spotted in 2012 with his “Lonely Microphone” LP on Italy’s Senufo Editions. No Way In is a further exploration of Colley’s terrain of internal dilemma, mental stress, paranoia, and the pessimistic contemplation of one’s fate. This could be a soundtrack to distract one from these thoughts, or it could be the trigger that stirs such things. 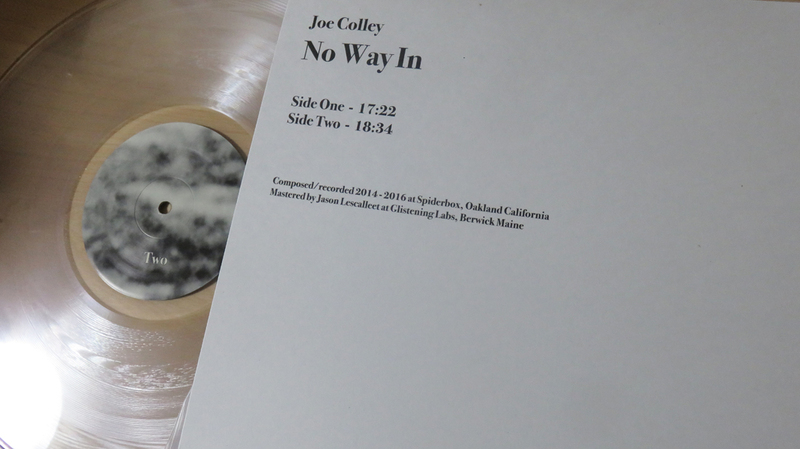 No Way In celebrates Joe Colley’s return from a self-imposed hiatus from creating music. 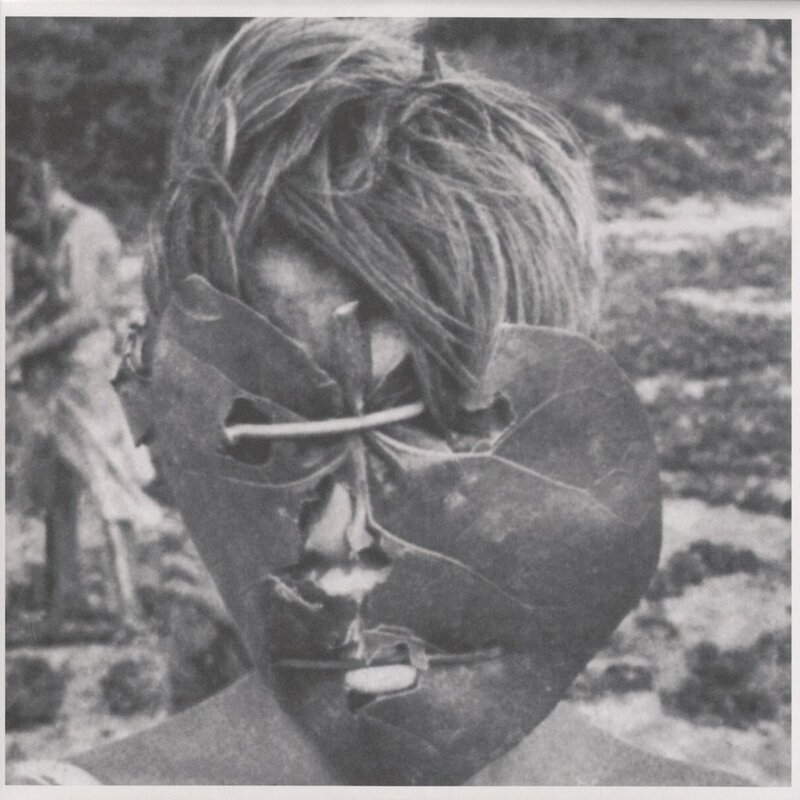 Colley was last spotted in 2012 with his Lonely Microphone LP on Italy’s Senufo Editions. No Way In is a further exploration of Colley’s terrain of internal dilemma, mental stress, paranoia, and the pessimistic contemplation of one’s fate. This could be a soundtrack to distract one from these thoughts, or it could be the trigger that stirs such things. A stunning black and white cover photo on an uncoated, raw stock outer-sleeve with a black poly-lined inner-sleeve. Composed and recorded from 2014 to 2016 at Spiderbox in Oakland, California. Mastered by Jason Lescalleet at Glistening Labs, USA. Includes a download code. Edition of 400. Visual artist and composer based in Sacramento, CA (born in Ft. Lauderdale in 1972). 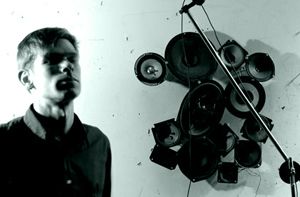 He investigates audio phenomena, using field recordings and electronics. He records also under the name Crawl Unit. He is the founder of the label Povertech Industries. Record label and publishing company based in Berwick, ME, USA. Founded 2006. Operated by Jason Lescalleet. Labels own studio is Glistening Labs. Numbered edition of 66 pressed on clear vinyl with black and white pixels spun out in a centrifugal pattern. Includes a poly-lined die-cut black inner sleeve and digital download coupon.